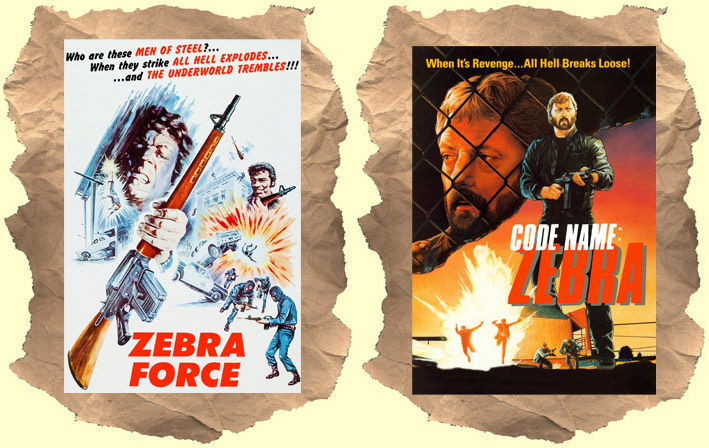 Zebra Force: This is one of my favorite cheesy 70's action flicks. After the war a horribly disfigured Nam vet gets his old platoon buddies together for a wild crime scheme to rid the streets of drugs (and make a little money on the side). The white ex-soldiers put on black face masks, gather together some serious weapons, and rob drugs and money from the Mob. The funny part is that once they pull the cheap rubber mask over their heads the filmmakers simply have a real African-Americans play the roles! Mike Lane does a good job as the "fixer" they call in to find out who the Zebra Force are. Big Rockne Tarkington (Black Samson) plays the leader of the black drug gang. Filled with gun battles, car chases, high falls (see below) and more. It all ends with a jaw-dropping final twist. Check it out! Code Name: Zebra The sequel to Zebra Force came 11 years later! Was anyone really waiting for this? I imagine the VHS boom of the 80's had something to do with it. This one is not quite as outrageous but it's equally cheesy, entertaining and fun. The focus of this film shifts to Mike Lane's Mafia fixer character from the first film. He's fresh out of prison and looking to get revenge on the remaining members of the Zebra Force. Lane is the only original actor who returns. The Zebra Force is now made up of new faces including the leader James Mitchum and Timothy Brown. When they hear Lane is out of prison they brace themselves for war. The Force once again goes up against the mob. Rubbing out the goons with guns and grenades, usually in slo-mo, with bodies flying through the air. The ex-soldiers get some sympathy from two jaded cops (including the great George "Buck Flowers!) who secretly admire what the Force does. Let's not forget the supporting help from Frank Sinatra Jr, Robert Z'Dar and Charles Dierkop as a character named simply "Crazy"!